I'm so with you on this, I just cannot imagine having a new doll and not playing with it. I sometimes worry that when I do get a new doll, that doll gets all the attention and the others have to just wait for me to turn back to them again, but at least I do end up turning back eventually! 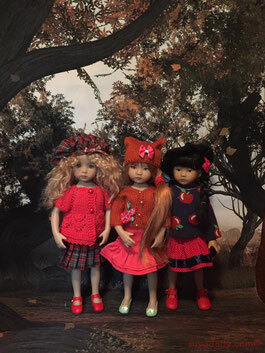 I love to keep changing their clothes.....sometimes I get a bit antsy because I find an outfit that really really suits a particular doll and don't actually WANT to change the doll, but I make myself do so and then I know I can always come back to it again. Because my girls don't really need coats I sometimes feel bad that they don't have any really...there might be the odd coat hanging around that I put on one of them and watch the poor kid sweating their socks off as it really isn't necessary, but they don't have outfits for 'occasions' and holidays.....I just put what I fancy on them at the time. They do have a lot of clothes though, waaaaay too many! I look forward to seeing all your clothing changes etc.